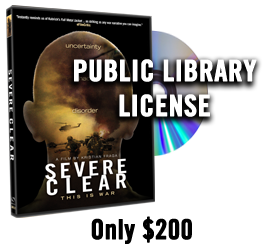 We encourage veterans organizations, community groups, non-profits, grassroots organizations and individuals across the country to organize screenings, houseparties and actions around SEVERE CLEAR in an effort to support the sacrifices of our troops and issues such as post traumatic stress disorder (PTSD). 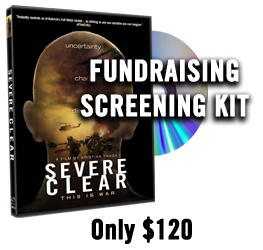 We have setup the Fundraising Screening Kit to help support community screenings around the country. 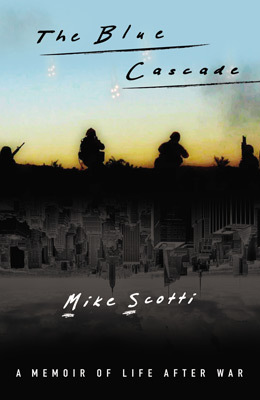 Identify your objectives and target audiences; are they veterans, soldiers, Marines, history buffs, film fans, etc. 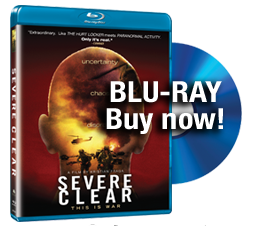 The best way to experience SEVERE CLEAR is on a big screen with a great sound system. As filmmakers we tried (to the best of our ability) to give the audience member a small taste of modern combat. A proper screen and sound setup will give your audience an experience they will not forget. Perhaps schedule a guest speaker or small panel featuring professors, veterans, filmmakers or history buffs. The movie was meant to set off a dialogue with the audience. Use our Fundraising Screening Kit to organize a screening that will pay for itself and raise money for your organization. 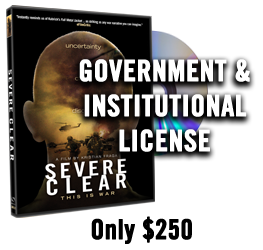 The screening kit includes enough extra DVDs to sell at the screening to cover the cost of the kit and make money for your group. A portion of all our proceeds go to a Military Charity. Get the word out and publicize the event! Publicity helps get people to attend your event, and also raises awareness for those who can’t be there! You may want to spread the word through mass e-mails and through social networks like Facebook, MySpace and Twitter. You may also want to work with partner organizations, put posters and flyers up in your community, or even send press releases to local media. ALSO PLEASE LET US KNOW ABOUT YOUR EVENT! We can announce on our website, facebook and email newsletter. We suggest giving a brief introduction before the screening to let people know that there will be a post-screening discussion, and to encourage them to stick around! 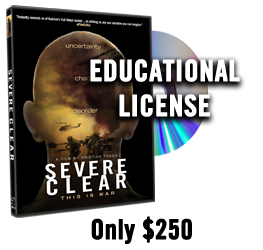 If you purchased a Fundraising Screening Kit you should also announce that you’ll be selling the DVDs that came with your screening kit, and to have someone available with the DVDs during the discussion. Use our conversation guide to help you frame questions and lead a targeted discussion about issues in the film and how to take action following your event. Send us advance information about your screening including the date, time and location, and a link to your website, and we’ll post your event on our screenings page, facebook and our email newsletter. Let us know how the event went afterwards, your responses will help us better understand what worked and what can be improved. To schedule a screening with an appearance and Q&A with Mike Scotti and/or Director Kristian Fraga please call or email Marc Perez for availability and fees at 212-244-4934 or perez@sirkproductions.com.